Moneycation: How much is the recommended down payment for property? How much is the recommended down payment for property? Buying a home can be an exciting experience, especially if you’re a first-time homebuyer. However, coming up with a sizable down payment to put toward the home can be a stressful experience. A home is likely the most expensive item most people will ever purchase. How much money should a person put toward their home? What do lenders recommend? Is there an average amount? Although most homebuyers are led to believe that they absolutely must put down 20 percent of the total home price as a down payment, this amount is not set in stone. It can actually vary dramatically, depending on several factors. According to MortgageCalculator.org, the benchmark figure that most lenders look for is 20 percent, while the Home Buying Institute lists the range as anywhere from 0 to 20 percent. With these figures in mind, the average is about 10 percent down. So what are these factors that lenders take into consideration when determining how much money homebuyers must put down? 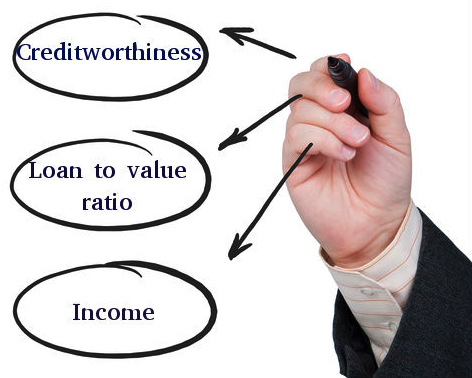 One of the biggest ones is creditworthiness. Generally, the higher your credit score, the less you’ll pay in interest, which will affect your down payment. If your score is 660 or above, you’ll likely pay less. However, if you pay more upfront, some lenders are willing to offer lower interest rates. The home’s loan-to-value ratio is another factor that lenders will look at. This shows the lender the remaining balance you will owe after a down payment is applied. It’s a ratio that shows the unpaid balance of the home versus its appraised value. This value should be under 80 percent in order to be approved for the loan. Income is another factor. Ideally, you should not put more than 28 percent of your gross monthly income toward mortgage payments. Therefore, to avoid this, you will need to adjust your down payment accordingly. The more cash you can put down, the lower your monthly payment will be. It may be worth it to save up for a longer period of time and put down a larger down payment that struggle month to month to make payments that are stretching your budget. A 20 percent down payment seems to be the benchmark for many lenders. Although many will allow you to put down less than 20 percent, they may require you to purchase private mortgage insurance (PMI). This is because the lender faces an increased risk of lending you more money to purchase the home. This expense will be added to your monthly mortgage. Don’t have enough money for a down payment? No problem! There are still many options available to help you become qualified for the home of your dreams. If you are thinking of buying a home, go to a professional mortgage broker. But when you go to mortgage broker make sure that they are reputed and are offering good rates. A wrong decision while choosing a mortgage broker can create big problems afterwards.